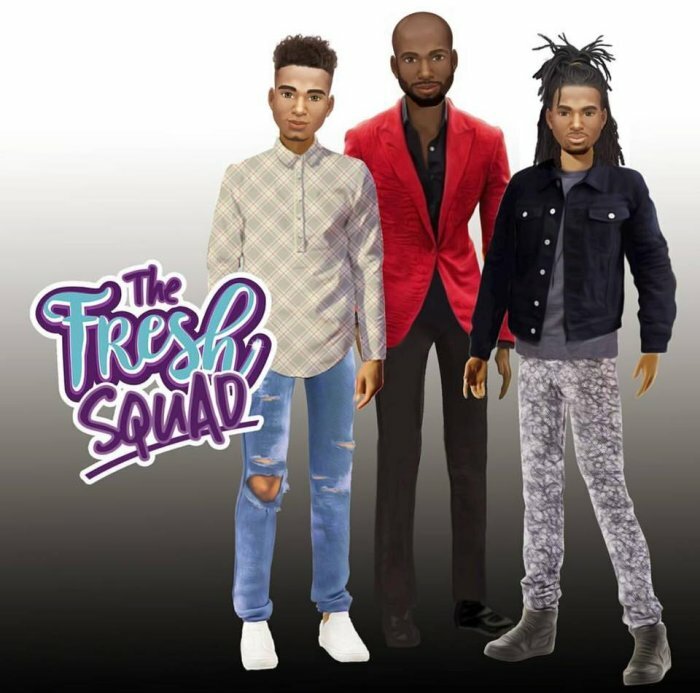 Next up in The 2018 PopCult Gift Guide we find a great new line of African-American fashion dolls, Fresh Dolls, and their male counterparts, Fresh Squad. Created by Dr. Lisa, of World of EPI fame, Fresh Dolls came on the scene last year hoping to fill a void in the fashion doll market. An extension of the Positively Perfect baby doll line, Fresh Dolls were designed with a variety of custom-blended skin tones ranging from deep mocha, caramel, latte, and even blended. They have authentic facial features, like beautiful full lips, and cute noses and eyes. Their stylish hair features braids, afros, afro-puffs, wavy and curly styles. FRESH doll bodies are specifically designed to be more representative of multicultural young women so they have fuller hips, thighs and more realistic waists. Due to popular demand, The Fresh Dolls are getting male companions. Shipping December 1 is The Fresh Squad, three male fashion dolls, with the same attention to multicultural detail and sharp design sense. That’s also the date that Fresh Dolls releases their second wave of female figures, including YouTube sensation, Froggy. These dolls are of interest not only for fashion doll fans, but also for action figure customizers. With a greater amount of articulation, and a much more diverse range of face sculpts and skin tones, these dolls are easily adapted into action figure dioramas, and can greatly expand a hobbyist’s selection of different characters with which to work. They’re very well-made, with terrific headsculpts and the rooted hair is much more realistic that what you find on a typical fashion doll. These are quality products. You can find Fresh Dolls at most toy retailers, as well as Amazon and their own website. In order to get the guys from Fresh Squad, or the second wave of Fresh Dolls in time for Christmas, you’ll have to order directly from the website. Fresh Dolls and Fresh Squad are great gift ideas for young girls who find Barbie to be a little too bland for their tastes, and also for 1/6 dioramists who want a larger cast of characters.